How to show full folder path of email search results in Outlook? Have you ever felt frustrated that the Outlook only shows the containing folder for each matching search results? If there are folders with same names in your Outlook, it is time-consuming to find the specific folder one by one for a certain search result. Showing full folder path of email search result is an efficient way for you to find the certain folder of the searched out emails. Please browse the following article for more detailed information. Sometimes, you may want to save or export the emails to a folder as other format files, such as PDF, Word or Excel files in Outlook. 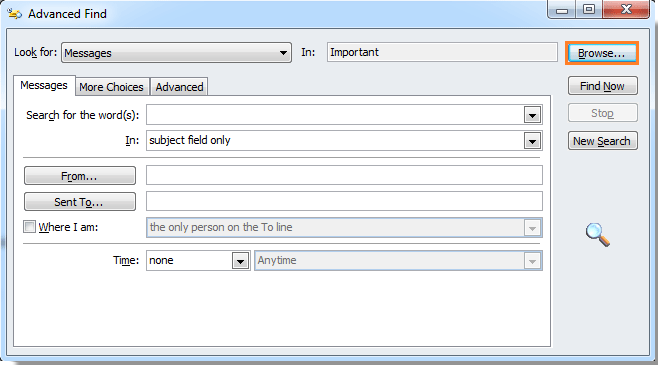 In Outlook, neither of the Save as and Export function can handle this job. However, Kutools for Outlook's Save as file utility can export multiple emails to a folder as files with multiple formats at once time . Click for 45 days free trial! Kutools for Outlook: with dozens of handy Outlook add-ins, free to try with no limitation in 45 days. 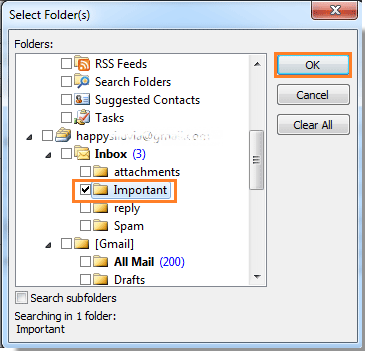 To find the full folder path of an email in search results list in Outlook, please do as follows. 1. After finishing searching emails, please select an email which you want to show its full folder path. 2. 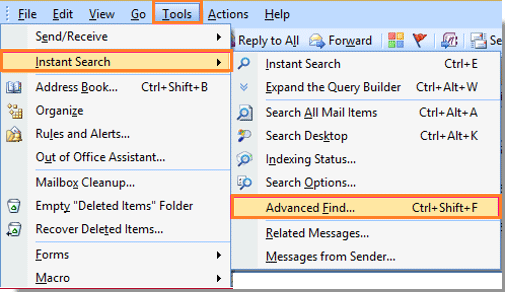 Then click Search > Search Tools > Advanced Find in Outlook 2010 /2013/2016, or you can press Ctrl + Shift +F shortcut keys to enable the Find and Replace function. 3. In the popping up Advanced Find dialog box, please click Browse button. 4. After clicking Browse button in the Advanced Find dialog box, a Select Folder(s) dialog box will pop up. In this dialog, you can see the specific folder of your selected email which is locating at has been checked with a mark. You can see the full folder path of the search result at a glance with this method, and the go to the certain folder to find the email you have search out easily.